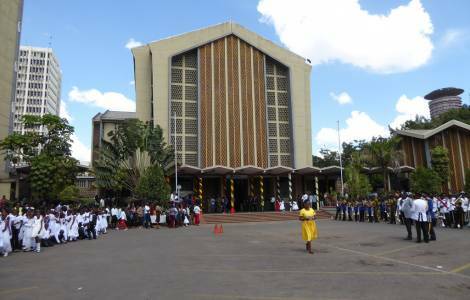 AFRICA/KENYA - The Bishops: "We urge all leaders across the political divide to support the newly found collaboration so that it does not remain a public relation exercise"
Archbishop Anyolo: "Mass media have the task of communicating the Gospel"
"In Kenya, evil is celebrated and good condemned. May Lent help us to heal"
Extraordinary Missionary Month: "Faith and charity to bear witness to our faith"
Nairobi (Agenzia Fides) - "We urge all leaders across the political divide to support this path so that it does not remain a public relation exercise or a show of two individuals", said the Bishops of Kenya at the press conference held yesterday, 14 March, during which the Church leaders have expressed their collective appreciation for the surprise meeting between the country’s President Uhuru Kenyatta and opposition leader, Raila Odinga. During their meeting, held on March 9, the two political leaders had launched an appeal to national unity, to overcome the divisions arising from the contested elections of 2017. The vote had been repeated in October after the Supreme Court had canceled the elections held in August. In both votes Kenyatta was the winner. "We wish to acknowledge the gesture of our two leaders, His Excellency President Uhuru Kenyatta and Rt. Hon. Raila Odinga, in meeting and extending hands of reconciliation among themselves, and as a sign of their commitment in collaborating towards uniting the deeply divided and polarized Country", said His Exc. Mgr. Philip Anyolo, Bishop of Homabay and President of the Conference of Catholic Bishops of Kenya (KCCB). In their press statement also sent to Fides, the Kenyan Bishops applaud the decision by the two political leaders to come together following a protracted electioneering period and describe the leaders’ gesture as "an opening to a greater commitment towards seeking real solutions to a more just, democratic and prosperous Country where every Citizen has an opportunity to develop". "The Catholic Bishops in Kenya want the dialogue to be all inclusive and participatory in nature and open to addressing all the issues that are of concern to this Country". "We wish to remind Kenyans that as Bishops we have in the past called on all leaders and stakeholders to employ constructive dialogue as the only way of resolving conflict", stressed Bishop Anyolo. Finally, the Bishops also called on the government not to forget their "primary mandate to protect its people", recalling the situation of insecurity in some parts of the Country, "particularly in Mount Elgon and in parts of Northern and Coastal regions"
"We thank all Kenyans for their continued prayers and maintaining peace even at critical moments of the recent past", the Bishops concluded.